The Currency of Kindness | Abez sez Assalamualaikum! I hereby resolve not to write about my head unless it’s a.) actual news, b.) actually interesting or b.) actually relevant. With that in mind (my mind being a figure of speech and not necessarily within my head these days, he he) tally ho! 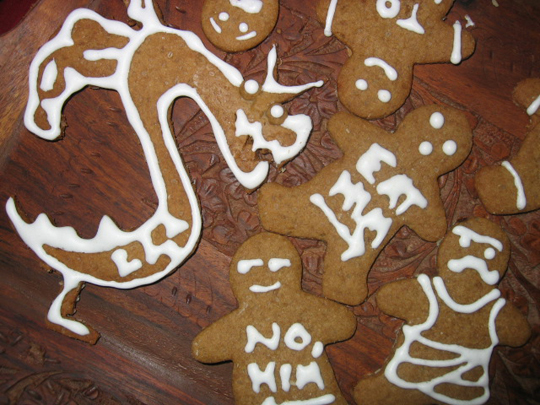 Cookies have always been used as more than just a sugary snack in my family, they are a mode of social interaction (invite friends over to bake & decorate some), they are a winter welcoming committee (nothing better than to be greeted at the door with a tray of cookies and some hot chocolate), a canvas for artistic expression (my Trogdor cookie rocks the socks off of your Ninja Turtle cookie. Yeah, but there are four of mine and only one of yours, Turtle Power!) and last but not least, cookies are an international currency. They are not subject to local exchange rates, and although their quantity may diminish over long distances, their value increases in direct inverse proportion to the available supply. Note: never send back store-bought or bakery-made cookies. Although these can be tasty, and sometimes even delicious (Milano!) they are not made with love. And sweat. And the occasional curly blonde hair that falls into the cookie dough that my mother pulls out later when no one’s looking, he he. October 28, 2004 in Uncategorized.